Avery Publishing Group, 9781583334652, 368pp. Lou Schuler and Alwyn Cosgrove's "The New Rules of Lifting," "The New Rules of Lifting for Women," and "The New Rules of Lifting for Abs "have revolutionized how people lift weights. "The New Rules of Lifting Supercharged "is a total reboot of the weightlifting workout book that launched the series in 2006, packing even more power on every page. Featuring ten completely new workouts for both women and men, "Supercharged "emphasizes four major movements that do the most to change the way your body looks, feels, and performs: squat, deadlift, push, and pull. In addition, Cosgrove's updated total-body workout program improves core strength, mobility, flexibility, balance, endurance, and athleticism . . . all in just three hours a week of exercise. Another big change from the original "New Rules of Lifting "is a self-customized workout system. Readers can choose their own exercises from a menu for each movement category, allowing beginner and advanced lifters to get tremendous results from the same basic plan. Each workout ends with a finisher five to ten minutes of fun but high-effort drills such as complexes, intervals, and density training, with the choice of the reader's favorite exercises. The ultimate guide to total-body strengthening, this supercharged edition of "The New Rules of Lifting "will lift readers to stratospheric results. 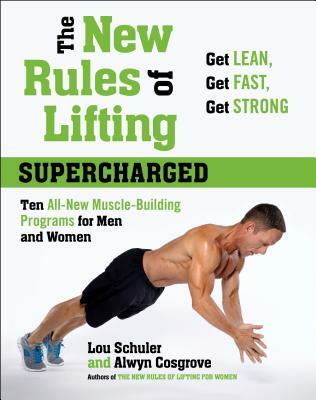 Lou Schuler is a National Magazine Award winning journalist, a certified strength and conditioning specialist, and the author of many top-selling fitness books. He lives in Allentown, Pennsylvania. Alwyn Cosgrove is a veteran trainer and strength coach. He co-owns Results Fitness in Newhall, California."